This morning, I wrote this article about how practically impossible it is for the ASUU nationwide strike that started to affect the NYSC in any way. A few minutes ago, the NYSC management confirms that the ASUU strike will not affect the National Youth Service Corps programme in any way. 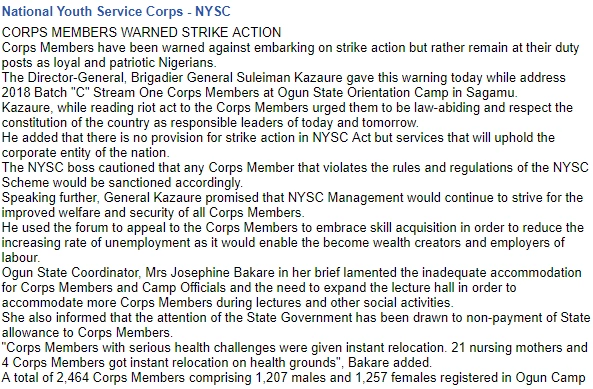 Corps Members have been warned against embarking on strike action but rather remain at their duty posts as loyal and patriotic Nigerians. The Director-General, Brigadier General Suleiman Kazaure gave this warning today while address 2018 Batch “C” Stream One Corps Members at Ogun State Orientation Camp in Sagamu. Kazaure, while reading riot act to the Corps Members urged them to be law-abiding and respect the constitution of the country as responsible leaders of today and tomorrow. He added that there is no provision for strike action in NYSC Act but services that will uphold the corporate entity of the nation. The NYSC boss cautioned that any Corps Member that violates the rules and regulations of the NYSC Scheme would be sanctioned accordingly. Speaking further, General Kazaure promised that NYSC Management would continue to strive for the improved welfare and security of all Corps Members. He used the forum to appeal to the Corps Members to embrace skill acquisition in order to reduce the increasing rate of unemployment as it would enable the become wealth creators and employers of labour. Ogun State Coordinator, Mrs Josephine Bakare in her brief lamented the inadequate accommodation for Corps Members and Camp Officials and the need to expand the lecture hall in order to accommodate more Corps Members during lectures and other social activities. She also informed that the attention of the State Government has been drawn to non-payment of State allowance to Corps Members. “Corps Members with serious health challenges were given instant relocation. 21 nursing mothers and 4 Corps Members got instant relocation on health grounds”, Bakare added. The orientation camp date and the call-up letter date remain the same. If you have anything to say, let us learn from you below in the comment box. PLEASE SHARE!